Cadet Merren stands ready for formation as her fellow cadets wait in back. Merren was chosen to be the guide-on bearer, carrying the flag and representing the entire class. Cadet Merren subdues officer Chuck Pelfrey while fighting through the effects of pepper spray. 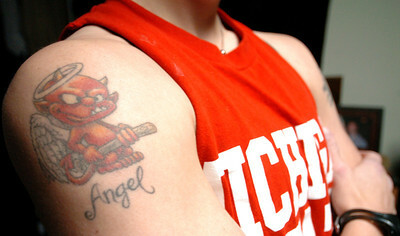 Angel has 4 tattoos, including this one on her shoulder. Cadet Merren leans on Cadet Ryan Banaszak as she waits to get tazed. 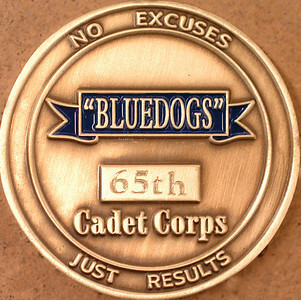 After graduation, all Cadets were given a coin, to signify an inclusion to the family of police officers. Drill Sergeant Todd Christiansen addresses Cadet Merren on military bearing during cadet indoctrination on day one of the academy. 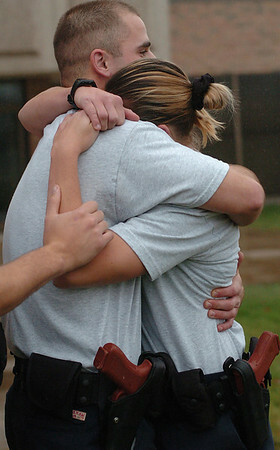 On day one, the cadets go through an immediate transformation from civilian life to law enforcement. 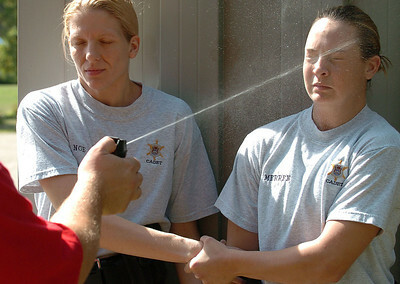 Cadet Angel Merren gives a confident thumbs up as her partner Tracie Noe helps her work through the effects of pepper spray. Cadet Merren tries to bring down officer Chuck Pelfrey during Redman training in week 16 of law enforcement training at KVCC. ALL - The Law Enforcement Academy at Kalamazoo Valley Community College is a 17-week program that costs $3700. Cadet Angel Merren gets hit with 50,000 volts of electricity during Tazer gun training as her fellow cadets hold her at the KVCC gym. Cadet Merren smiles during a lunch break with fellow cadets. Cadet Merren holds the class flag during morning formation. Merren was chosen to be the guide-on bearer, carrying the flag and representing the class. Cadet Angel Merren, right, works through the pain and sufffering of being pepper sprayed as cadet Elizabeth Buikema dunks her head for relief. 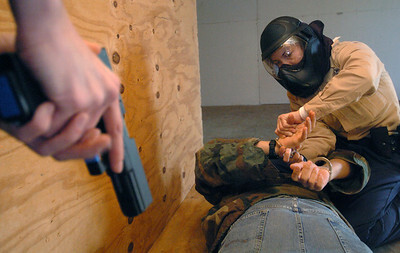 Cadet Merren takes down officer Chuck Pelfrey using a pressure point technique during Redman training in week 16 of law enforcement training at KVCC. Angel embraces cadet Matthew Vanderploeg after enduring 50,000 volts of electricity for 5 seconds during tazer training. For the first and only time in Angel's police academy training, she broke down and lost control. "We understood each other. I knew he'd be there when I needed him," she said. 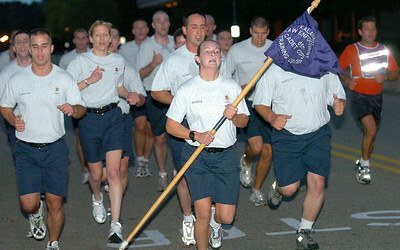 Cadet Merren carries the flag and leads the class on a 5-mile early morning run. At right is Drill Sergeant Todd Christiansen. Merren was chosen to be the guide-on bearer, carrying the flag and representing the entire class. Angel says a prayer with her father Jim Merren at her Wayland home before eating a power meal consisting of venison, cheese, white bread and milk. 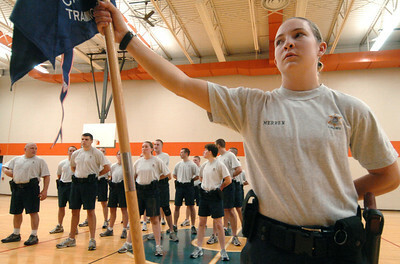 "I definitely grew closer to my dad throughout the Academy," she said. Cadet Merren handcuffs a suspect as partner Tracie Noe provides cover during a building scenario. 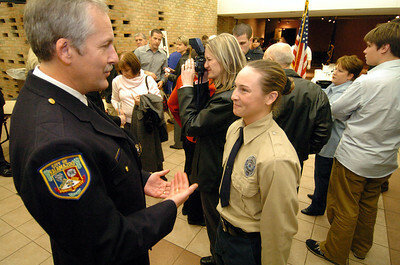 Cadet Merren talks to KDPS police chief Dan Weston about a future job after graduation ceremonies at KVCC on December 7. 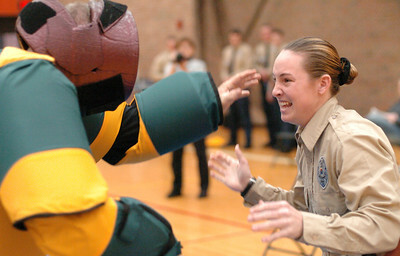 Cadet Angel Merren gets maced in the face as her partner Cadet Tracie Noe helps her. The Cadets must learn to work through the effects so they'll be prepared for a real-life situation. 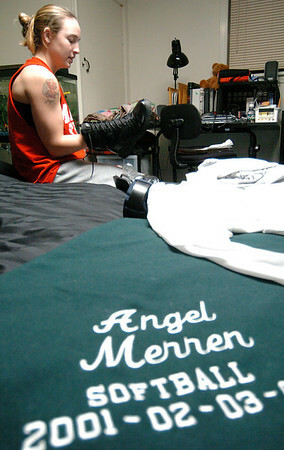 Angel Merren shines her boots at her home in her bedroom in Wayland as part of her nightly routine after a long day of classes and physical training. Before entering the Academy, Angel attended MSU on a full ride softball scholarship. Cadet Merren performs CPR on a baby and rescues Lisa Graham-Blier in a rescue scenario at KVCC. 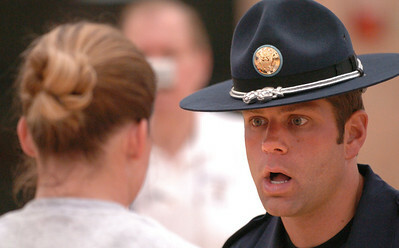 Merren encountered several real-life scenarios throughout the academy. Angel hugs her MSU assistant softball coach, Amanda Scott, after the graduation ceremony at KVCC on December 9, 2004.